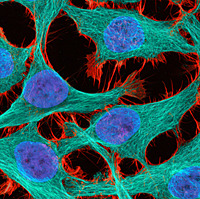 I was of course familiar with the basic facts of the Henrietta Lacks story: Decades ago, a doctor at Johns Hopkins harvested tumor cells from an unsuspecting African-American female who died from cervical cancer, observed the cells flourishing/replicating at an amazing rate, they distributed these “HeLa” cells to fellow researchers, others replicated them on a grand scale, and researchers worldwide have used them almost immediately (and ever since, fast-forward 60 years) to advance science and improve human health in some pretty spectacular ways. But as carefully unraveled throughout the pages of this book, the many layers of this story, the issues at hand, and the perspectives of the individual players involved are so complex and much more multidimensional than one could ever dream. You would be hard-pressed to find a more provocative topic, one that stirs opinions that are felt so deeply within one’s moral center. I found myself teetering back and forth endlessly as the book went on, appreciating and relating to so many of the perspectives presented while trying to figure out how I really felt about it overall. I kept coming back to how I would FEEL and what I would THINK were I in the shoes of… The patient herself. The family kept perpetually in the dark. The doctors involved in harvesting the cells. The researchers (then and now) who use the cells daily. The countless souls that advancements from HeLa cells have impacted (both those aware of and those ignorant to her contribution). Even picturing myself in the shoes of the author, as her long journey of patient, steadfast investigation and discovery must have provided such emotional and intellectual twists and turns. Every perspective imaginable in this account has a subjective measure of validity, and taking pause to acknowledge the incredible changes in our very culture over the decades during which this story has developed only adds to the richness of the story and the need for it to be told. The haunting fact remains that these serious failings, the critical choices, and morally dark dealings have brought such illumination to discovery—a beautiful tragedy. Henrietta was forced into life outside of herself as HeLa, and through efforts of patient, investigative minds like Skloot, has been brought back to us in a way that transcends our very definition of life—existence immortalized by a simple yet unsuspectingly immeasurable contribution of self that no man could have possibly envisioned.When the HBO movie (backed by Oprah) finally materializes, it will give both Henrietta Lacks and HeLa the most public stage to date, and she might finally be openly recognized as one of the most important contributors to modern medicine, in spite of (and because of) the perfect storm of circumstances. 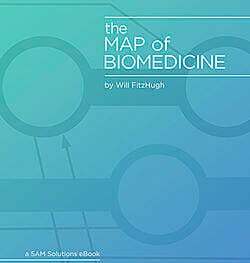 The book itself was moving, at times gut-wrenching, certainly enlightening, and repeatedly forced the reader to ask questions of themselves that had no clear answers—the kind of book that you forcefully share with your friends and relatives beyond the usual suspects that already live in the world of HeLa cells. 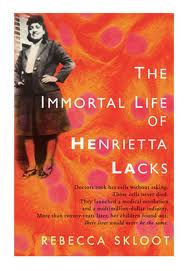 I have great hope that http://rebeccaskloot.com/events/ will only further enhance what I have already learned about this accidental scientific pioneer, and will continue the important work to restore Henrietta from HeLa. Last year (2013), the HeLa genome was sequenced twice. The European Molecular Biology Laboratory (EMBL) and by a lab at the University of Washington (funded by NIH) both published papers on their separate efforts. This triggered a wider discussion at NIH about the release of genetic information from the Lacks family. Francis Collins, the director of NIH, met with the Lacks family at Johns Hopkins University to explain the current work and how this sort of information is generally used. They worked out a process for approving research using the information: the data is stored in dbGaP, where researchers can apply for access. Those applications are reviewed by a committee that includes members of the Lacks family, and any resulting papers must acknowledge Henrietta Lacks and her family. The University of Washington/NIH paper was the first to go through this process. "http://www.nature.com/news/deal-done-over-hela-cell-line-1.13511" has more information about the arrangements. Researchers can http://www.ncbi.nlm.nih.gov/projects/gap/cgi-bin/study.cgi?study_id=phs000640.v2.p1. While this arrangement is certainly unique, it illustrates the evolving nature of consent in research. Henrietta Lacks certainly wasn't asked for consent when her tumor cells were immortalized, but today her family participates in a process not unlike the http://info.5amsolutions.com/blog/bid/156083/5-Things-to-Look-Forward-to-in-Dynamic-Consent.